Yes, another Kickstarter (they seem to be everywhere these days don't they), this time up though is a project I got the chance to contribute to last year, and can say that there is some really fine game journalism at the heart of their offering. 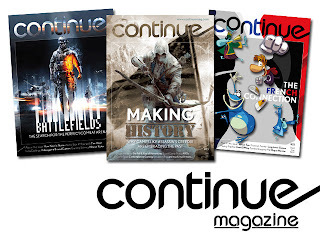 The folks behind Continue magazine are looking for funding for their next four issues, to raise awareness, and hopefully build a viable business model for the magazine moving forward. The level of writing is top notch, and the games industry needs more good, thoughtful, and deep coverage, so it's a project worth backing in my book. Check out their campaign page and see for yourself!